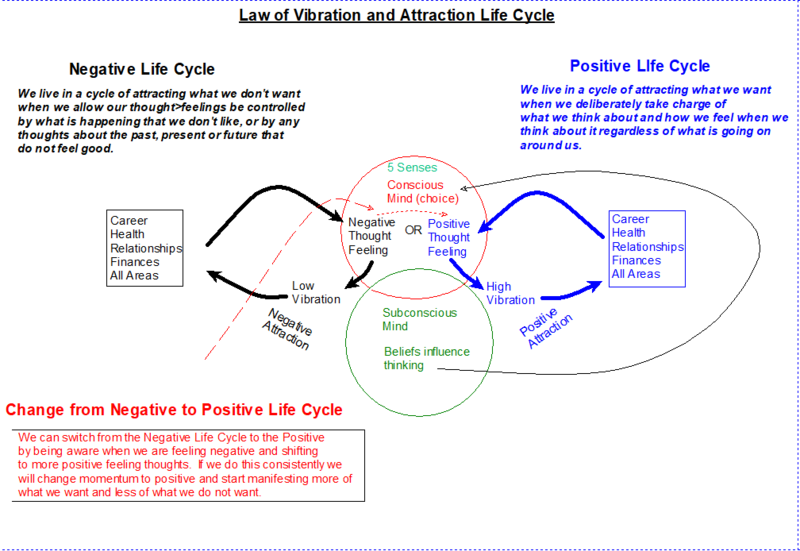 As you can see from looking at the diagram below there are two distinctive cycles of life experience; a positive cycle and a negative cycle. The cycle we experience is related to how we interpret the things in our life. 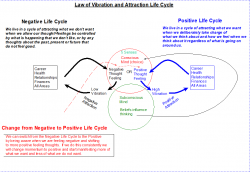 This causes feelings about life and about our self and if those feelings are negative then we stay in the negative cycle and continue to draw negative experiences towards us. We can however at any time choose positive interpretations and therefore positive feelings and cause positive experiences to be drawn to us. The critical point where we can switch from one cycle to another is through the choice we make in our conscious mind as you can see in the diagram. Of course to enable new choices takes new awareness. This is where my Higher Vibrations Program can help you to take charge of your life in any area by providing you with the facts of life, that we did not receive, and how to apply them in your every day life so you can consciously choose the positive cycle of life. Essentially to be a master of your mind is to be a master of your life, this is what the program will show you how to do.